This is a powerpoint about a thank you letter from a ranger at Cap Lookout. Let the web editor know of something special and you can have it posted here. Half the Districts have meetings with the state officers this year and the other half next year. Check the years of your meetings as well as the date its self. SCNP Society is inviting you to attend its program at the Landrum Depot at 211 North Trade Avenue, Landrum, SC, April 16, a week from tomorrow. The event is free and open to the public. The program starts at 7pm. Arrive at 6:30 for refreshments and socializing. The topic is Oconee Bells. The Oconee Bells: Lost and Found Treasure of the Upstate. 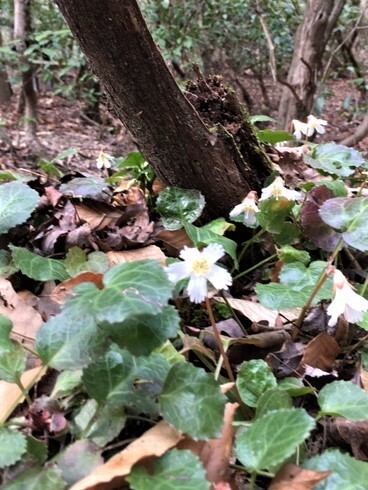 The April 16th Native Plant Society meeting on Tuesday, April 16 at 7pm, explores the story of the Oconee Bells, (Shortia galacifolia), a rare and beautiful Spring blooming wildflower found in only a few places in the world. One of those places is the Jocassee Gorges in Upstate South Carolina. Naturalist Kay Wade will present the story of the discovery, “loss” and rediscovery of this tiny beauty which draws hundreds of people to the upstate every March when the Bells are in bloom. The presentation will be given at Landrum Depot at 211 North Trade Avenue, Landrum, SC. The event is free and open to the public. The program starts at 7pm. Arrive at 6:30 for refreshments and socializing. For more information and directions, go to www.scnps.org. Banner Elk Garden Club decorating the music stage for performances during the 41st Annual Woolly Worm Festival in Banner Elk on Saturday and Sunday October 20 and 21,2018. Photos from District 2 Garden Club meeting Tuesday October 9,2018 at Holston Camp Banner Elk,NC. Advance Garden Club members enjoyed a March meeting program, “Caring for Orchids”, by Barbara Specter. Mrs. Specter discussed potting materials, popular potted orchids, and favorite orchid flowers like Cymbidium. She also demonstrated how to repot and care for orchids. Advisory Committee Ombudsman to present a dual program for the residents at the Mocksville Senior Living facility. Sister Martha Hoyle spoke to the residents about their resident rights and the role of the ombudsman as their advocate. The members of the Advance Garden Club followed with a program. Each club member selected an antique not normally associated with gardening and filled it with a plant. After the members discussed their plants, the residents were asked to guess the real purpose of the container. What followed was a great deal of spirited guessing. The club members all spoke later about how much they enjoyed the afternoon interacting with the residents. Advance Garden Club members had two classes on floral design prior to their submissions to the Dixie Classic Fair. A class on creative design was conducted by Charlotte Croft, District Director and the second class involved members critiquing each others design. Advance Garden Club members attended the District 4 Garden Clubs of North Carolina meeting held at the Old Town Club where the club received a certificate of honor and won second place for their yearbook. Mary Ann Spainhour presented a very informative program to the Advance Garden Club on “Raising and Managing Orchard Mason Bees”. The members learned that these bees do not sting unless greatly provoked, do not live in a hive and are great pollinators of our spring flowers, fruit trees and vegetables. The members also received instruction in how to build their own bee houses. The Advance Garden Club has awarded the October Yard of the Month to Heather and Rob Freeland of Magnolia Acres in Advance. The fall theme that surrounds their entry and perfectly kept lawn presents an appealing picture to anyone passing their home. They both work on their garden in their spare time after work. Heather’s mom is a Master Gardner in another state. Advance Garden Club did a presentation for the ladies at Trinity Elms Assisted Living Center. Each member brought a plant in a container not normally used for plants. After each member discussed their plant/flower, the residents were asked to guess the normal use of the container. The ladies became involved in guessing and telling others about similar containers they had when they were younger. The result was that the ladies did such a good job guessing that they were rewarded with prizes and the club members were rewarded with a fun afternoon meeting them. The Advance Garden Club took a field trip to the Children’s Center to listen to Joanne Yates speak about her role as a trained horticultural therapist working with children with special needs. Horticultural therapy involves a person in nature and garden related activities to help them reach a specific treatment goal. She toured the group thru the therapeutic garden discussing different plants and how she is able to involve the children in the classroom and the garden awakening them to the awe of nature. With a gentle breeze and a warm morning sun, the weather was perfect for Cedarwood Garden Club’s April 11 tour of the Mariana H. Qubein Arboretum and Botanical Gardens at High Point University. Their guide was Matt Mahoney, Landscape and Exterior Enhancement Manager. As the members gathered at various garden areas, Matt gave interesting histories of the development, the processes and reasons for the designs, and unique information on plants ranging from rare trees to familiar perennials. It was a delightful morning and many members plan to visit again in the near future, possibly with family members to enjoy the beautiful gardens. After the tour, many members went to the Rice Paper, a Vietnamese restaurant, for lunch, where they relaxed, chatted and enjoyed some delicious food. It was a lovely time to be together. The 2019 Garden Tour offers a wide variety of gardens, each with their own personality. Several gardens are oriented around special mature trees and structures. Some gardens are casual, surrounding small cottage style homes. Other gardens surround historic homes and some gardens share space with chicken coops. Visitors to the gardens will discover ponds with fish and frogs and that some weed encouragement alongside cultivated plants attract a variety of pollinators. All of the gardens are the result of owners who find challenge, peace and creativity in their efforts to develop beautiful spaces. They welcome the opportunity to share their gardening visions with visitors during the 2019 Hillsborough Spring Garden Tour. Come and explore “Beyond the Garden Gate”. Tickets can be purchased on line at www.hillsboroughgardenclubnc.com or in person at the Visitor’s Center, 150 E. King Street, Hillsborough, NC. Tickets are $20.00 before April 20, then increase to $25.00. Ticket sales support the Hillsborough Garden Club scholarship program and community beautification projects. Margie Watkins Volunteer Spirit Award for her volunteer work at the beautiful Duke Gardens. It is a beautiful bronze statue which I am sure she would be willing to show at the next meeting in November (which will be at her home). A huge THANK YOU to all of you who made the flower arranging activity possible for the young North Carolina flood evacuees staying at the Friday Center. It is amazing what this club can accomplish in under 24 hours. You received the email late Thursday and Friday afternoon children were enjoy being under the trees and “arranging/playing” with flowers. The children had definite opinions on color combinations. And let me tell you they knew exactly where they wanted us to cut the stems their scissors wouldn’t handle. The care they gave planning their arrangement for Mother was heart warming. One adult who had lost everything said just looking at the flowers gave her peace. Tickets may be purchased online, at various vendors, the Azalea Festival Ticket Office and in the gardens. The Cape Fear Garden Club invites you to enjoy Southern hospitality amid the vibrant color of azaleas and spring flowers during the 66thannual Cape Fear Garden Club Azalea Garden Tour. One of the longest running and most popular garden tours in the South, the 2019 tour features 11 gardens – a variety of styles with something certain to inspire every gardener. Three of the gardens are “Secret Gardens” and only accessible via a trolley. The Azalea Garden Tour opens Friday, April 5, 2019 at 10:00 am with the Ribbon Cutting and Azalea Queen’s Garden Party© at the home of Linda and Steve Smits, 1925 S. Live Oak Parkway, presented by WWAY-TV. Entrance is free. Arrive early and enjoy a preshow of live music by members of the Wilmington Symphony. Highlighting the event will be the Parade of Belles featuring more than one hundred Cape Fear Garden Club, Inc. Azalea Garden Belles© along with the introduction of the 2019 Azalea Queen and North Carolina Azalea Festival celebrities and entourage and entertainment by the Girls Choir of Wilmington. After the ceremony, enjoy the Azalea Queen’s Garden Party in the garden of Linda and Steve Smits where members of the Cape Fear Garden Club will serve punch and over 5,000 homemade cookies. The Cape Fear Garden Club reinvests proceeds from the Azalea Garden Tour into our community through beautification and horticultural grants, scholarships and support of the Battery Island National Audubon wildlife sanctuary. More than $1.2 million has been granted over the 65 years. Beaufort, Bertie, Camden, Currituck, Date, Edgecombe, Gates, Halifax, Hertford, Hyde, Martin, Northhampton, Perquimans, Pitt, Pasquotank, Tyrell, Washington and Wilson.